Even though in the beginning I thought it was part of the M.L.M. Network’s project (a closed circuit television designed for the public transportation), a project based on Liviu Iane’s idea, it didn’t took me so long to figure out that the buses are the new Mercedes Citaro (equipped with GPS) acquired by RATB and recently available on the public transportation routes like 131, 331, 205 and 182. The buses are equipped with ecological engines, passenger counter system, surveillance video cameras and a GPS system that displays data on a LCD monitor. The GPS system shows the main bus route and the adjacent streets (with their names). Also, the system displays the distance between the bus stations. I think it would be great for tourists to see on the GPS monitor the main tourist objectives and attractions (like parks, museums, memorial houses and other attractions – in the same way that the closed circuit television was designed) while the bus pass by them. 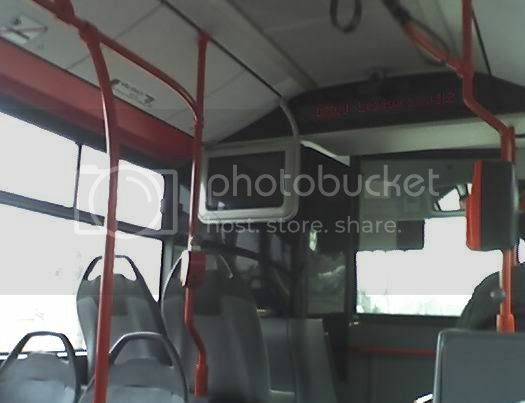 Sunt curios cat o sa tina monitorul ala din fata autobuzului. Or să fie la locul lor mult timp de acum încolo, doar să coste prea mult întreţinerea lor 🙂 .